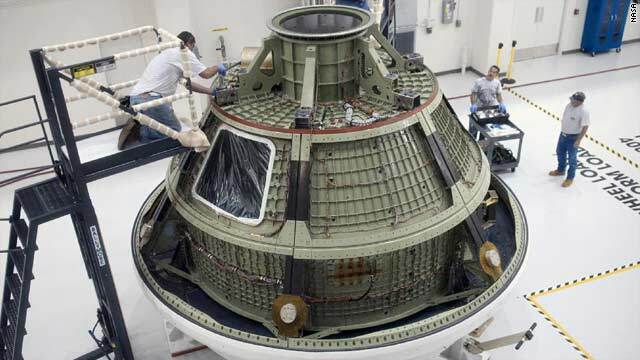 "The Orion Ground Test Vehicle arrived at NASA's Kennedy Space Center Operations & Checkout (O&C) Facility on April 21. The vehicle traveled more than 1,800 miles from Lockheed Martin's Waterton Facility near Denver, Colo., where it successfully completed a series of rigorous acoustic, modal and vibration tests that simulated launch and spaceflight environments. The ground test vehicle will now be used for pathfinding operations at the O&C in preparation for the Orion spaceflight test vehicle's arrival this summer. The spaceflight vehicle is currently being fabricated at NASA's Michoud Assembly Facility in New Orleans, La., and is slated for NASA's Exploration Flight Test, or EFT-1, in 2014."